Buschbeck Masonry, Stone and DIY BBQ Gas Conversion Kit. The 2 burner stainless steel Buschbeck gas conversion kit is easy to assemble, just insert on the base of the cooking area of your masonry BBQ. Connect your gas cylinder to the front connector and start cooking. 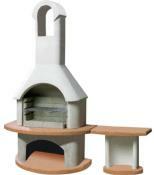 You can convert any charcoal masonry or stone BBQ to gas with a minimum cooking area base width of 54cm. Why not design you DIY BBQ and have the option of charcoal or gas. Ideal for all Buschbeck barbecues. 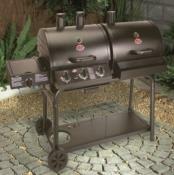 2 burner gas barbecue Insert for Masonry Barbecue. All stainless steel gas insert burner. Designed to run on propane the insert kit comes all complete with a clip on propane regulator and hose and will take just seconds to fit. Gas insert even comes with stainless steel flame tamer bars. They vapourise all the juices that come in to contact with them. Dimensions: W50 X D34 X H7cm approx. 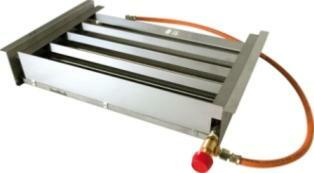 Cooking grill is not included, this unit is designed to be fitted under your existing grill. 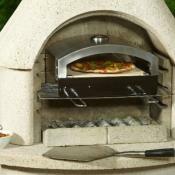 For masonry, DIY and stone BBQ's with a minimum internal width of 54m.